Found artifact resembles kappa head? 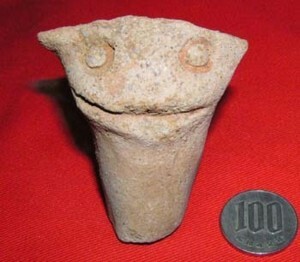 Archaeologists in the town of Umi in Fukuoka prefecture have excavated a piece of earthenware shaped as the head of a creature with googly eyes and a big grin. Opinions are divided about whether this artifact, which was unearthed from a site dating back to the Muromachi period (1336 to 1573 AD), is supposed to represent the head of a demon, dragon, snake or kappa. The artifact, which is now on display at Umi Museum, measures 5.4 cm (2 in.) tall and is believed to be one of the feet of a larger earthenware vessel. It appears that a sharp bamboo implement was used to shape the eyes and mouth. "If this is a kappa," says museum director Koji Hiranouchi, "it is a very old representation. The craftsman was probably playing around when he made it." Others believe the artifact is supposed to represent some sort of reptile or amphibian. If you ever decide to keep a kappa as a pet, check out the indispensable Kappa no Kaikata (How to Raise a Kappa), a 26-part series of animated shorts on Animax, with English subtitles (viewable on YouTube). These videos will help you avoid some of the pitfalls of raising a kappa. For example, the first episode shows the disastrous effects of what happens when you feed kappa-maki (cucumber sushi rolls) to your kappa. Evidently, wasabi disagrees with its digestive system. On June 21, researchers at Waseda University's Institute of Egyptology unveiled the computer-generated facial image of an ancient Egyptian military commander that lived about 3,800 years ago. The image is based on CAT scans taken of a mummy. Researchers claim the mummy, which was unearthed near Cairo at an archeological site in North Dashur, is from ancient Egypt's 13th dynasty (c.1756 to c.1630 BC), and according to inscriptions on the sarchophagus, it appears to be that of a military commander named Senw. 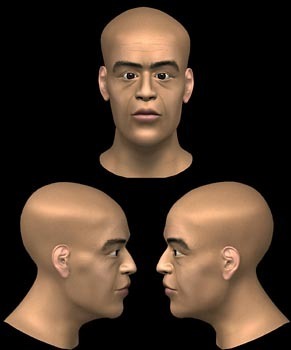 The facial image, which was created by a team of graphic artists from the Joshibi University of Art and Design, is based on bone structure data obtained from CAT scans of the mummy. The research group determined that he was a middle-aged to elderly man, and from information such as the military commander's title they hypothesized he was of mixed race. The artists worked to provide the face with strong, military commander-like features, referring to ancient Egyptian pictorial representations and sculptures. "We had to rely on artististic imagination for the parts we did not understand," says Sakuji Yoshimura, Waseda University professor who led the research team. Several faces were generated, and the one that most resembled that of a military commander was chosen. The face will be on display to the public beginning in July at Fukuoka City Museum. You can read more about the mummy HERE. A consortium of Kyushu-area businesses, including robot developer TMSUK (Kitakyushu), has developed a compact robot hand. 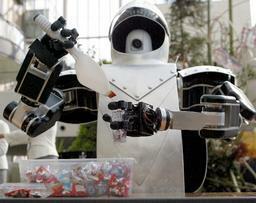 In Fukuoka on January 9, a robot equipped with the hands demonstrated its dexterity by scooping candy into bags. Each hand features three fingers, 20 cm (approx. 8 inches) long when measured from the controller located in the palm to each fingertip, and each finger is equipped with three motors at its joints. Yasukawa Electric, which participated in developing the hand, boasts that it is the world�s smallest. The dream of developing robots for domestic use or for electronic product assembly is growing. However, the production cost for a pair of hands is equivalent to that of a luxury automobile. Lower costs should open the door to a wide range of business opportunities.